After seven years of covering the UTMB, this year we’re covering the CCC in addition to the UTMB. Find our full news stream of the event in this article as well as more resources to help you follow the race. You can also venture over to our Twitter feed and see more updates on our Facebook page. 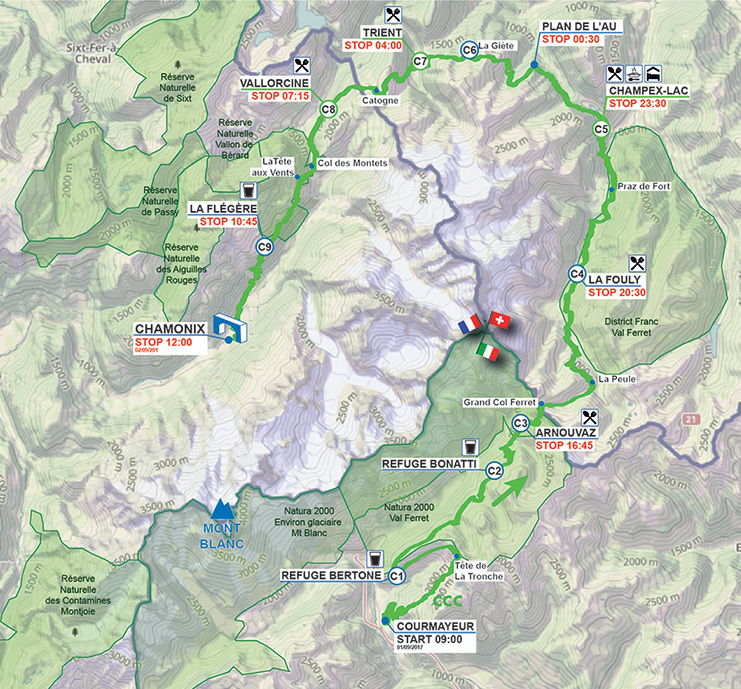 The CCC is a 101-kilometer (62.8-mile) route beginning in Courmayeur, Italy and traveling counterclockwise around Mont Blanc to Switzerland and, then, France before arriving to its Chamonix, France finish line. It has 6,100 meters (about 20,000 feet) of climb. We’re excited to help tell the race’s competitive story! We’ll be covering CCC live starting at 9 a.m. CEST (1 a.m. MDT in the U.S.) on Friday, September 1. The race administration’s live tracker for all entrants. Please consider making a donation in support of our coverage of the CCC. Thank you!